Is My Business Accessible? Conducting A Self-Assessment: What Do I Need to consider? Is my business grandfathered? What do I need to do to make it accessible for people with disabilities? What tools are available to assist in this process? Many business owners state that they want to make their business accessible but don't know where to start. 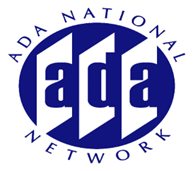 The ADA Guide to Small Business produced by the US Department of Justice outlines some basic activities that a business can do to determine whether or not they are meeting the requirements of the ADA. Conducting a review of the physical accessibility of a facility can be an overwhelming task. Determining the scope of the review as well as potential accessibility solutions can stymie even the most seasoned businessperson. Many give up out of frustration. Join our speaker as he outlines the steps to be taken when initiating a self-assessment as well as tools and resources that are available.